Malaria, Schistosomiasis (Schistosoma mekongi), and Opisthorchiasis (Opisthorchis viverrini) are a tremendous health burden on the people of the Lao PDR. Although significant reductions in malaria transmission have been reported due to the large-scale distribution of insecticide-treated bed nets (ITNs) through the Global Fund to Fight AIDS, Tuberculosis and Malaria, strategies based on the scientific evidence have not been developed to deal with the genetic variations in parasite and vector populations, and drug-resistant malaria. Recently, artemisinin-resistant malaria was reported in southern provinces [1, 2]. Therefore, it is necessary to survey other provinces, especially the five southern provinces of the country, to monitor and contain the spread of drug-resistant malaria. 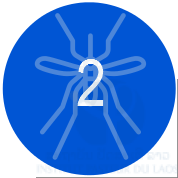 The Lao Ministry of Health and the WHO have set a goal of eliminating malaria by 2030. To achieve this goal, we have to understand the real malaria situation, including drug-resistant malaria, prevalence of glucose-6-phosphate dehydrogenase (G6PD) deficiency, the prevalence of asymptomatic Plasmodium carriers, malaria situation among mobile and migrant populations, and develop effective elimination strategies. Significant progress has been made in the past decades in the reduction of the prevalence of Schistosomiasis (S. mekongi) in the endemic areas (approximately 200 villages) in Khong district and Mounlapamok district, Champasak province, Lao PDR, through preventive chemotherapy using praziquantel as the drug of choice once a year as well as health education in the community. However, current monitoring methods rely on the Kato-Katz stool examination whose sensitivity may not be sufficient to detect light S. mekongi. Infections. In 2017, WHO adopted a new strategy that accelerates the elimination of Asian schistosomiasis in the Western Pacific Region, i.e., transmission interruption by 2025 and eradication by 2030. One criteria of transmission interruption is “no new case of animal infection.” To achieve this goal, we need sensitive detection methods, such as DNA diagnostic methods (PCR and LAMP) and serological methods (ELISA), to monitor the prevalence of the disease precisely in the endemic areas. Since Opisthorchiasis (O. viverrini) is localized to the Lao PDR and surrounding countries, it is recognized as a neglected tropical diseases. Nevertheless, the prevalence of opisthorchiasis is estimated to be as high as 15–54% in the Lao PDR. Little information on the molecular/genetic epidemiology of opisthorchiasis is available to develop effective measures for prevention and diagnosis of the disease. The government of the Lao PDR requested the Japan International Cooperation Agency (JICA) to establish the Lao–Japan Joint Laboratory within Institut Pasteur du Laos (IPL) to conduct highly technological research on human malaria parasites (Plasmodium falciparum, P. vivax, and the monkey malaria parasite P. knowlesi) and human trematodiases (S. mekongi and O. viverrini). The joint research will concentrate on genetic epidemiological studies to detect and control the emergence and dissemination of these parasitic diseases. The project also contributes to the capacity development of researchers and technicians in the Lao PDR through training in field and lab work, seminars, and career development. In order to carry out this project, the IPL in collaborating with the National Center for Global Health and Medicine (NCGM), Tokyo, Japan, Tokyo Medical and Dental University (TMDU), University of the Rukyus, Okinawa, Japan, the Center of Malariology, Parasitology and Entomology (CMPE), the Lao Tropical and Public Health Institute (Lao TPHI), and other Departments of the Ministry of Health, Lao PDR. The objectives of this project are (1) to develop more convenient and accurate methods (PCR methods, LAMP methods, etc.) for diagnosis of the diseases, (2) to monitor the temporal and spatial epidemiological situations of pathogens and vectors of the diseases, (3) to analyze mechanisms of emergence and expansion of drug-resistant malaria, especially artemisinin resistance, and (4) to analyze the G6PD activity of the Lao population for evaluation of the possible usage of primaquine [3, 4], utilizing molecular biological techniques. Based on the scientific evidence obtained by this project, health education for the people will be strengthened and the endemicity of the diseases will be monitored together with the local Lao Ministry of Health officials. Research results will also be utilized in government services for the sustainable development of the Lao PDR. Savannakhet province, Salavan province, Sekong province, Attapeu province, Champasak province, Khammouane province, Phongsali province, Luang Prabang province. Khong district and Mounlapamok district, Champasak province. Opisthorchiasis (O. viverrini): Khammouane province, Champasak province. The SATREPS project was approved by the National Ethic Committee for Health Research, the Ministry of Health, Lao PDR from 2014 to present (extended each year). We conducted twelve field surveys on parasitic diseases including malaria patient’s blood collection from public healthcare facilities and refresher training course. We also conducted training on parasitic diseases for medical lab technicians in Phongsaly province. In 2018, one Medical Lab Technician and one Junior Scientist in our lab attended training course on molecular parasitology at the National Center for Global Health and Medicine, Tokyo, Japan in February and August, respectively. This activity report summarizes our activities and the results of the SATREPS project in the Lao–Japan Parasitology lab from November 2017 to October 2018. All field surveys were conducted in collaboration with the CMPE, Provincial Health Departments, and District Health Departments, the Ministry of Health, Lao PDR. 1. Malaria field training in Gnot Ou district, Phongsaly province, 31st October to 5th November 2017. 2. Schistosomiasis spot-check survey in Khong district,C hampasak province, 26th November to 8th December 2017. 3. Malaria survey for blood sample collection in Khong district, Champasak province, 25th to 28th February 2018. 4. Malaria survey for blood sample collection in Khong, Mounlapamok, and Pathoumphone districts, Champasak province, 5th to 7th March 2018. 6. The 1st Schistosomiasis animal survey in Khong district, Champasak province, 6th to 23th May 2018. 9. The 3rd Schistosomiasis animal survey in Mounlapamok district, Champasak province, 22nd July to 2nd August 2018. 10. Malaria survey for blood sample collection and refresher training course in Salavan and Sekong provinces, 13th to 18th August 2018. 11. Schistosomiasis spot-check survey in Khong district, Champasak province, 19th August to 2nd September 2018. 13. Schistosomiasis spot-check survey in Khong district,C hampasak province, 28th September to 8th October 2018. Written informed consent was obtained from all the participants prior to interviews and biological sample collection. The guardians of child participants consented to their participation. The Kato-Katz thick smear method of stool examination was used for detecting S. mekongi eggs in the stool samples. DNA diagnostic method (LAMP method) was used for detecting S. mekongi DNA in the stool and snail samples. ELISA was also used for detecting S. mekongi antibody in the blood samples. Dried blood spot samples were collected in filter paper from both malaria patients and suspected patients in public healthcare facilities in malaria endemic areas. DNA diagnostic methods (PCR or LAMP) were used for detecting and identifying Plasmodium species. Artemisinin resistant mutation(s) in kelch propeller domain (K13) of chromosome 13 in Plasmodium falciparum was examined by PCR and DNA sequencing. Schistosomiasis mekongi has been endemic in Khong district (152 villages: approximately 86,000 people) and Mounlapamok district (50 villages: approximately 37,000 people), Champasak province in Lao PDR. Significant progress has been made in the past decades in reduction of prevalence of S. mekongi in the endemic areas through preventive chemotherapy (or mass drug administration: MDA) using praziquantel as drug of choice once a year as well as health education in the community. Community-led Initiative to Accelerate Elimination of Schistosomiasis with Water Supply, Sanitation and Hygiene (CL-SWASH) plan is now ongoing by NAMSAAT (The Center for Environmental Health and Water Supply under the Ministry of Health) in the endemic area. The Ministry of Health and WHO have selected seven sentinel site villages (five in Khong and two in Mounlapamok) for monitoring the prevalence of Schistosomiasis mekongi among villagers in the endemic areas (Figure 1). In addition, five–ten villages are randomly selected as spot-check sites every year for monitoring the prevalence of the disease. IPL is one of the members of technical working group for Schistosomiasis elimination in Lao PDR and participates the National Schistosomiasis surveys every year. The prevalence of Schistosomiasis was estimated by microscopy using the Kato-Katz stool examination method. A total of 200 villagers (100 children: 6–14 years old and 100 adults: 15–65 years old) were randomly selected from each village. Two stool samples (day 1 and day 2) were collected from each participant and two Kato-Katz thick smears per sample were examined by microscopy (total four smears per participant), to increase the sensitivity of the Kato-Katz stool examination . When two stool samples were not obtained from the participant, we excluded the data of the participant from the final result. Although the Kato-Katz method as a standard method for detecting the parasite eggs in stool samples, the sensitivity of the Kato-Katz method was not enough to detect light levels of infection. Therefore, in addition to the stool sample, one dried blood sample on filter paper was also collected from the participant for detecting antibody of S. mekongi by ELISA. IPL participated in the Lao National Survey for Schistosomiasis. 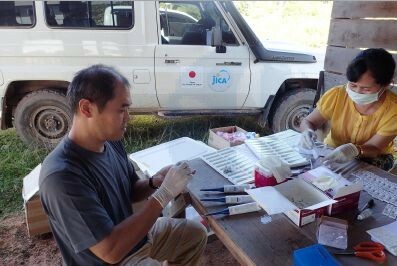 In this survey, IPL took responsible for collecting dried blood samples (n=850) on filter paper (Advantec Blood Sampling Paper Type I, Toyo Roshi Kaisha Ltd. Japan) from villagers living in the endemic areas for detecting antibody for Schistosoma by the ELISA. In this survey, six endemic villages (Hua Sadam, Hang Sadam, Done Phapheng, Det Ork, Done An and Done Tan) were selected in Khong district as spot-check sites. The ELISA is now being performed at IPL. On the other hand, stool examination by the Kato-Katz method was performed by staff members from CMPE, Champasak Provincial Health Department and Khong District Health Department on site. The result of stool examination was shown in Table 1. IPL organized a spot-check survey with CMPE, Champasak Provincial Health Department and Khong District Health Department in two villages (Kengkoum and Hangxangphai). The survey was conducted as the same way, i.e., dried blood samples (n=492) and stool samples (n=973) were collected from the villagers (Table 2). The ELISA will be performed at IPL, while stool examination by the Kato-Katz method was performed on site. Result of the Kato-Katz stool examination was shown in Table 3. IPL participated in the National Survey for Schistosomiasis in two villages (Hauhinoy and Thakham). In this survey, IPL took responsible for collecting dried blood samples (n=254) on filter paper for the ELISA. The ELISA will be performed at IPL, while stool examination by the Kato-Katz method was performed on site. We perfumed the ELISA using the blood samples that previously collected from five villages (Don Khao, Muang, Don Kaden, Don Khamao, Longsong) in Schistosomiasis spot-check surveys in 2017. IPL conducted the spot-check surveys in Don Khao and Muang, while Lao TPHI and Nagasaki University conducted the surveys in the other three villages. S. japonicum egg soluble antigen was used for detecting antibody of S. mekongi by the ELISA. A total of 845 dried blood samples was examined and the result was shown in Table 4. All the ELISA data in 2016 and 2017 with the Kato-Katz data were summarized in Table 4. Prevalence of S. mekongi by the ELISA was much higher than that by the Kato-Katz stool examination method. Generally, the Schistosoma antibody remains in a human body for certain period (up to 10 years) after treatment by praziquantel. Therefore, some of the ELISA positive cases represent a history of previous infection by S. mekongi. The Lao Ministry of Health has conducted mass drug administration (preventive chemotherapy) with praziquantel in 202 villages in the Khong district and Mounlapamok district, Champasak province, once a year with health education. If new infection or re-infection does not occur among the villagers, both the antibody titer of the villagers (previous patients) and the antibody positivity rate in the villages would decrease gradually. To achieve eliminating Schistosomiasis mekongi in Lao PDR, we developed a novel and easy molecular diagnosis (LAMP medthod) and made a risk map for Schistosomiasis in Khon Island. For the field application, we combined the LAMP method with an easy DNA extraction method from stool and snail samples. In this study, we proposed the risk map developments by combining the satellite data with results of the LAMP. We performed the field surveys in Khon Island which was the high endemic area of S. mekongi. Approximately 500mg of stool samples from 100 people, and more than 3,000 snails (Neotricula aperta) were collected in the Island once a year from 2016 to 2018. The surveys were conducted in every April, which is the end of rainy season. Heat-alkaline DNA extraction and the LAMP were performed by Dr. Kumagai, member of the SATREPS project in the TMDU, Japan. The stool sand snail samples were sent to Dr. Kumagai’s lab in the TMDU by a shipping company (FedEX) with appropriate packing on 8th May 2018. An authorization for sending the stool and snail samples from the Lao PDR to Japan was obtained by Dr. Sengchanh Kounnavong, Director of Lao TPHI, the Ministry of Health before sending. A Material Transfer Agreement (MTA) was signed between the TMDU and IPL before the samples were sent to Japan. The results were plotted in the satellite maps derived from satellite data, and compared with the satellite data by year. The prevalence of S. mekongi of the stool samples was 2.9% with the LAMP in 2016. On the contrary, the prevalence of the snails was 0.26% in 2016, whereas the prevalence decreased to 0.08% in 2017, and finally to less than 0.03% in 2018. By combining the satellite data with the LAMP data, we found that the positivity rate of Schistosoma infection was correlated with rainy precipitation of the previous year. The locations of the infected snail habitats in the river were adjacent to houses, where Schistosomiasis patients were living. The LAMP method is an effective tool for obtaining the basal information to make the risk map. The satellite data would be also useful for infection prediction of schistosmiasis mekongi. To achieve Schistosomiasis elimination, we have to consider prevalence of Schistosomiasis among animals in the endemic areas in Khong and Mounlapamok districts, Champasak province. For example, Vonghachack et al., reported that dog can be infected with S. mekongi and the prevalence was 14.7% (10/68) in Khong district . 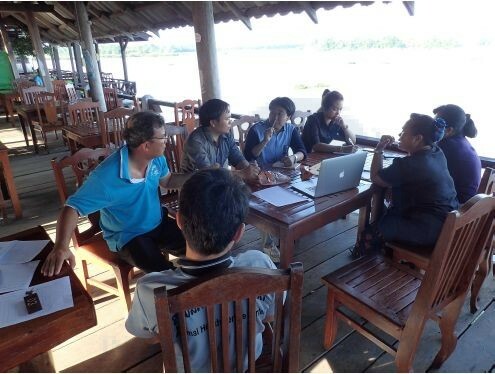 To understand the situation of animal Schistosomiasis in the endemic areas, WHO Western Pacific Regional Office IPL and Lao TPHI conducted three Schistosomiasis animal surveys in 2018. These surveys were conducted by collaboration with two sectors: health sector and animal sector with financial support of WHO WPRO. From health sector (the Ministry of Health), IPL, CMPE, Lao TPHI in Vientiane, Champasak Provincial Health Department, Khong District Health Department, and Mounlapamok District Health Department participated in the surveys. From animal sector (Ministry of Agriculture and Forestry), National Animal Health Laboratory (NAHL) in Vientiane, Animal Health Service Center in Pakse city, Champasak province, Department of Agriculture and Forestry Khong District, and Department of Agriculture and Forestry Mounlapamok District participated in the surveys. The animal surveys were conducted in the seven sentinel site villages selected by the Ministry of Health and WHO Lao PDR office in 2016 for Schistosomiasis elimination. We examined five animal species (dog, cattle, water buffalo, pig and goat) for the surveys based on discussion with WHO and Lao TPHI. Assuming 10% of prevalence, using 5% precision with 95% confidence interval, the minimum sample size is 139 for each animal (20 animals x 7 villages = 140 animals per species). Animals were randomly selected by using a list of animals in each village. Stool and blood samples were collected from the animals for detecting S. mekongi egg, antibody, or DNA. (Ministry of Agriculture and Forestry), National Animal Health Laboratory (NAHL) in Vientiane, Animal Health Service Center in Pakse city, Champasak province, Department of Agriculture and Forestry Khong District, and Department of Agriculture and Forestry Mounlapamok District participated in the surveys. The animal surveys were conducted in the seven sentinel site villages selected by the Ministry of Health and WHO Lao PDR office in 2016 for Schistosomiasis elimination. We examined five animal species (dog, cattle, water buffalo, pig and goat) for the surveys based on discussion with WHO and Lao TPHI. Assuming 10% of prevalence, using 5% precision with 95% confidence interval, the minimum sample size is 139 for each animal (20 animals x 7 villages = 140 animals per species). Animals were randomly selected by using a list of animals in each village. Stool and blood samples were collected from the animals for detecting S. mekongi egg, antibody, or DNA. A total of 700 stool samples and 704 blood samples were collected respectively (Table 5). Microscopic examination was performed by quantitative formalin-ethyl acetate concentration technique (FECT) using the stool samples at Lao TPHI . No S. mekongi egg was detected by the FECT (Table 6). DNA diagnosis was performed by the LAMP method using the stool samples at IPL. S. mekongi DNA was detected by the LAMP method from one dog (1/144) and one pig (1/153) stool sample in Phonpeuy village. The ELISA will be performed for dog and pig using their blood samples. We collected both dried blood spot samples on filter paper and serum samples preserved at -30oC. Blood samples from the animals with the LAMP positive (S. mekongi DNA positive) will be used as a positive control for the ELISA. The simian malaria parasite P. knowlesi is prevalent in macaque monkeys in Southeast Asian countries. Human infections with this parasite were thought to be extremely rare until multiple human infections were reported in 2004 from Malaysian Borneo . Thereafter, several cases of human infections, including fatal cases, were reported from several Southeast Asian countries other than Lao PDR [9–12]. Recently, however, a malaria study of long-tailed macaques in Southeast Asian countries demonstrated that 2.3% (1/44) macaques originating from Lao PDR was infected with P. knowlesi, but the exact geographic location where the infected macaque was captured in Lao PDR was not given . In this study, we collected 2,698 finger-prick blood samples from malaria patients (positive by microscopy or RDT) on the filter papers from 156 public healthcare facilities in the five southern provinces in Lao PDR from October 2015 through October 2016, for detecting human infection with P. knowlesi. We examined all the blood samples by PCR. We found that one case of human infection with P. knowlesi confirmed by DNA sequencing of two gene regions: partial cytochrome b gene (cytb) of mitochondrial genome and merozoite surface protein-1 gene (msp1) of nuclear genome. Molecular phylogenetic trees were constructed based on polymorphic sites in the partial sequences of both gene regions using the neighbor-joining method in MEGA version 7.0.21  (Figure 2). 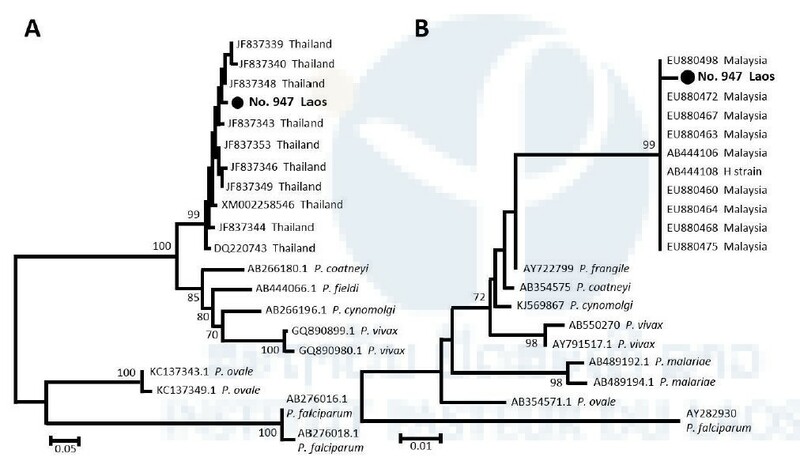 In the phylogenetic analysis, the partial DNA sequences of the genes from the patient isolate clustered with the sequences of P. knowlesi isolates from Thailand or Malaysia . The patient was a 12-year-old Laotian boy living in Bengvilay village, Sanamxay district, Attapeu province (adjacent to Cambodia) in Lao PDR. He visited Bengvilay Health Center on 17th July, 2016. He manifested malaria-like symptoms and signs, such as high fever (40oC), shivering and nausea when he visited the health center. The patient did not have a history of traveling outside of Attapeu province, Lao PDR. The fever started three-days before he visited the health center. He was diagnosed as having been infected with P. vivax malaria by a Rapid Diagnostic Test (RDT) kit (Malaria Ag P.f/P.v, Standard Diagnostics, the Republic of Korea) at the health center and a three day-course of artemether/lumefantrine was prescribed. The patient recovered after the treatment. Artemisinin based combination therapies (ACTs) have been used as a first line treatment for uncomplicated malaria in Lao PDR since 2005. However, artemisinin resistant P. falciparum was first reported in 2013 and is indeed threatening malaria elimination by 2030. It is reported that mutations of K13 gene in P. falciparum are associated with artemisinin resistance and can be used as a molecular marker for monitoring artemisinin resistant P. falciparum. The aim of the study is to assess the distribution and frequency of the K13 mutations in Lao PDR. Malaria patient blood samples were collected in 156 healthcare facilities in the five southern provinces from October 2015 to November 2016, and the northern-most province from November to December 2017. Real-time PCR was performed to identify Plasmodium species and direct DNA sequencing was followed to detect the K13 mutations and their haplotypes. In the five southern provinces, there were 1,553 cases of P. falciparum, in which 52.8% had artemisinin resistant mutations; Attapeu (71.8%: 107/149); Champasak (70.2% 384/547); Sekong (42.1%: 72/171); Salavan (56.4%: 150/266); Savannakhet (25.5%: 107/420) (Table 7). A C580Y mutation in the K13 was predominant, followed by R539T, Y493H and P574L. In Phonglasy, the northern-most province, there were eight malaria cases: three P. falciparum, three P. malariae and two P. vivax. The three P. falciparum possessed the C580Y mutation. In addition, we performed haplotype analysis of two gene regions (PfK13_151 and PfK13_159) of upstream of the K13 gene using the three P. falciparum isolates from Phonglasy in December 2017 and 438 P. falciparum isolates from the five southern provinces from October 2015 to April 2016. The haplotype analysis suggested that the geographical origin of the C580Y mutation was from western Cambodia (Figure 3). The artemisinin resistant P. falciparum originated from Cambodia has already been spreading in the southern-most provinces with high frequencies and reached the northern-most province of Lao PDR. Data were analyzed with Microsoft Excel. For bivariate analyses, the Chi-square test and Fisher’s exact test were used to evaluate an association between variables and Plasmodium infection. P-values less than 0.05 were considered statistically significant. Multivariate logistic regression analyses adjusted for the effects of other variables were conducted to estimate the association between variables and the K13 mutated P lasmodium infection using SPSS version 18.0 (SPSS INC., Chicago, IL, USA) and STATA version 11 (StataCorp, USA). Several models were constructed using significant variables (P <0.05) in the bivariate analyses. Risk factors associated with contracting P. falciparum possessing the K13 mutation were estimated by multivariate logistic regression analyses. Four variants were independently associated with contracting P. falciparum possessing the K13 mutation: residing in Attapeu and Champasak provinces (Model 1, adjusted odds ratio [AOR]: 1.57, 95% CI: 1.14–2.16), adult (Model 1, AOR: 2.24, 95% CI: 1.18–4.22), male (Model 1, AOR: 1.96, 95% CI: 1.32–2.90), and malaria history (≥3 times) (Model 1, AOR: 1.59, 95% CI: 1.15–2.21) (Table 8). In other words, regardless of the residential area, adult male with at least three histories of malaria had significantly more risk to get P. falciparum possessing the K13 mutation. This finding highlights the importance of surveillance of artemisinin-resistance to achieve the elimination of malaria in Lao PDR. Artemisinin resistant P. falciparum has been spreading across Southeast Asia. Patients’ adherence to ACTs is critical to avoid expansion of this resistance. The objectives were to examine patients’ adherence to the ACTs and to examine the healthcare workers’ perception of medication adherence in Savannakhet province. Ms. Emiri Takahashi, member of the SATREPS project as well as PhD student from University of the Ryukyus designed and conducted this study by collaboration with Savannakhet Provincial Health Department. A prospective observational study on patients and a descriptive study on healthcare workers were conducted in Xepon, Phin and Nong districts. In the patient study, patients aged 18 years old or older who were prescribed the ACTs at six healthcare facilities between October 2016 and August 2017 were examined. Data were collected both on the first day of the treatment (day 0) and on the day of follow-up (around day 3) through interviews with the patients and observations of leftover tablets. In the healthcare workers study, data were collected in all the public healthcare facilities through self-administered questionnaires from those workers who had ever instructed malaria patients. Of the 54 patients examined, 51 (94.4%) were adherent. The other three patients stopped medication because they felt better, even though the importance of completing the regimen was explained when prescribed. The healthcare workers perceived the major reasons for non-adherence to be patients’ illiteracy and patients’ poor understanding. In practice, 27.6% of them did not regularly tell a patient the importance of completing the regimen. The level of adherence to the ACTs was high. Healthcare workers should tell patients the importance to complete the regimen and they also confirm the patients’ understanding of the instructions. This finding will be published in Tropical Medicine and Health (accepted for publication in 2018). Generally, military personnel are at risk of malaria infection deployed in remote forest areas. The aim of this study was to determine the prevalence of malaria infection and assess the perception, preventive and treatment behaviours regarding malaria among Lao military personnel. Mr. Phoutnalong Vily, member of the SATREPS project as well as PhD student from University of the Ryukyus and staff member of CMPE designed and conducted this study by collaboration with Military Institute of Diseases Prevention, Department of Military Health, Ministry of Defense, Vientiane, Lao PDR. A mixed methods study was undertaken in Champasak and Attapeu provinces. Quantitative data including blood samples from 351 military personnel, seven focus group discussions and 17 in-depth interviews were collected. Fieldworks were conducted from September to October 2017. The prevalence of Plasmodium infection was determined by PCR at IPL. Two statistical methods were used to determine the association of valuables. Content analysis for the qualitative data was applied to explore perception and treatment behaviours regarding malaria. PCR detected Plasmodium infections in 11.2% of blood samples (35/313) (Table 9). The species distribution was P. vivax mono-infections at 82.9% (29/35), P. falciparum mono-infections at 11.4% (4/35), and mixed infections with P. falciparum and P. vivax at 5.7% (2/35). RDTs identified only three P. vivax mono-infections, six P. falciparum mono-infections and one mixed-infection with P. falciparum and P. vivax. Asymptomatic P. vivax infections accounted for 97.1% of the total infections. More than half of participants did not know that malaria was transmitted by Anopheles mosquito bites, but believed that it was transmitted through drinking stream water (Table 10). Their camps was lacking in preventive equipment, diagnostic and treatment services. Symptomatic individuals practiced self-treatment using both modern and traditional medicines. Prevalence of asymptomatic Plasmodium infection was high among the military personnel in remote forest areas. Misperception of malaria transmission route existed. Lacking in appropriate malaria preventive and treatment services was often occurring. Providing adequate and appropriate health education, comprehensive protective equipment, on-site malaria testing and case management should be established among them. This finding was summarized and submitted to Tropical Medicine and Health for publication (Under review). Primaquine is necessary to prevent P. vivax from relapsing and indispensable for malaria elimination in Lao PDR. To ensure its safe therapy, the G6PD status of patients must be clarified as primaquine given to G6PD deficient individuals could result in life-threatening hemolysis (Ong et al., 2017). The objective of this study was to determine the prevalence of G6PD deficiency among the populations. Mr. Ken Ing Cherng ONG, member of the SATREPS project from The University of Tokyo designed and conducted this G6PD study among the populations in malaria endemic areas in Champasak, Savannakhet, and Phongsaly provinces. Four field surveys were conducted from February 2016 to October 2017, and the G6PD enzyme activity was measured through the semi-quantitative test using G6PD Kit (DOJINDO Laboratories, Japan). Blood samples with less than 60.0% of the enzyme activity were selected for further genetic analysis. All exons of the G6PD gene except exon 13 were sequenced by ABI Genetic Analyzer 3500XL at PIL. We analyzed blood samples collected from 2,043 villagers and 136 had enzyme activity less than 60.0%. Out of the 136 villagers, 90 had the G6PD Viangchan variant (871G>A), three had the Canton-variant (1376G>T), and two had the Mahidol variant (487G>A). The percentages of G6PD deficient villagers confirmed by the genetic analysis were as follows: 6.1% in Champasak, 5.5% in Savannakhet, and 0.5% in Phongsaly. All villagers with the Viangchan variant were from Savannakhet and Champasak and 40 (44.4%) were from the Lao ethnic group. The Canton variant was found in Savannakhet in three villagers from the Lao Katang, and Mangkong ethnic groups respectively. In Phongsaly, we found two villagers from the Akha ethnic group who had the Mahidol variant. To avoid complications such as acute hemolytic anemia, the G6PD status of patients must be known prior to prescribing primaquine to them. We conducted a malaria health seeking behavior survey in Thapangthong district, Savannakhet province from 1st to 10th October, 2018. We selected two villages, one Lao ethnic village and one Katang ethnic minority village for this survey. Both villages had the highest number of reported malaria cases in the district. In this survey, we used mixed methods quantitative and qualitative data collection, to holistically understand the health seeking behaviors of the villagers. Quantitative data were collected using a software installed in tablets to facilitate data collection. We asked the villagers about their knowledge of malaria, health seeking behaviors, and their perceived ability to prevent malaria in addition to their socio-demographic characteristics. We collected qualitative data through focus group discussions and in-depth interviews. We found that many villagers still do not have the right knowledge of the cause of malaria. Through focus group discussions, many villagers still responded that malaria was caused by, “drinking contaminated water” or “drinking water with mosquito eggs or larvae”. This result has a serious implication on the elimination efforts as the villagers might not protect themselves properly from malaria. Regarding the health seeking behaviors, many villagers mentioned that the recently introduced National Health Insurance scheme or ‘Kor Por Sor’ helped to reduce the cost of treatment at the public health centers and they were more willing to go to the public health centers for treatment. Although mobile and migrant populations are considered an important group in malaria elimination settings, there is currently a lack of understanding about foreign migrant workers in Lao PDR. This study aimed to document the migration characteristics, positive rate of malaria infection and preventive and treatment seeking behavior for malaria among foreign migrant workers in the malaria endemic districts of Savannakhet province, Lao PDR. A community-based, cross-sectional survey was undertaken in four districts (Thapangthong, Nong, Xepon, and Phin) of Savannakhet province led by Dr. Tiengkham Pongvongsa, Savannakhet Provincial Department and Dr. Daisuke Nonaka, University of the Ryukyus, between February and June, 2015. IPL and CMPE also participated in this survey. Questionnaire-based interviews and blood examinations, including malaria RDT and PCR, were conducted with 391 migrant workers who were registered at local police departments. Most of the study participants were men (75.7%) and Vietnamese (92.6%). The median age (interquartile range) was 31 (25 to 41) years old. Most common occupation was factory worker (47.6%), followed by trader/shopkeeper (21.5%) and plantation worker/farmer (16.4%). The median length of stay (interquartile range) in the districts was 405 (183 to 1,207) days. The majority of the participants (85.9%) had not worked in a province other than the study province, nor had the majority (92.6%) worked in a foreign country other than the Lao PDR. Although most of the participants (62.7%) reportedly used a bed net daily, these nets were mostly conventional untreated ones. No one tested positive for malaria. However, 10.0% of the participants reported a malaria-like illness episode that had occurred in the Lao PDR. The most common measure taken for the episode was to visit a hospital/health center in the Lao PDR, followed by conducting self-medication alone. Forty-one participants reported an experience of working in the forest while living in the Lao PDR. Foreign migrant workers who are registered at local police departments are unlikely to play a major role in maintaining local transmissions and spreading drug resistant malaria in the study province. However, some of them were involved in forest-related activities, suggesting that these workers are at risk of malaria. The Lao National Malaria Control and Elimination Program should educate foreign migrant workers about the risk of malaria when living in Lao PDR. This finding was summarized and submitted to Tropical Medicine and Health for publication (Under review). The objective of malaria patient blood sampling is to monitor the distribution and frequency of drug resistant malaria in Lao PDR. We collected 2,557 dried blood samples on filter papers (FTATM Classic Card, GE Healthcare Life Sciences, WhatmanTM, UK) in 2018. The number of blood samples and sampling period in each province are shown in Table 11. The dried blood samples (n=2,459) were collected from malaria patients who visited 156 public healthcare facilities in the four southern provinces (Savannakhet, Salavan, Sekong, and Champasak). Malaria patients mean that the patients were diagnosed as malaria by either the RDTs or microscopy at healthcare facilities. On the contrary, the dried blood samples (n=98) were collected from malaria suspected patients who visited eight public healthcare facilities in Phongsaly, the northern-most province. Malaria suspected patients consist of both malaria patients confirmed by either the RDTs or microscopy and malaria negative people confirmed by the tests even though they manifested malaria like signs and symptoms. The blood samples are now being analyzed by nested real-time PCR for identification of Plasmodium species. Mutations of drug resistant genes, such as the K13 gene, or pfcrt gene, are also being examined using P. falciparum positive samples at IPL and NCGM. The Phongsaly samples were sent to NCGM, Japan by a shipping company (DHL) with appropriate packing on 12th and 27th December 2017. We also sent dried blood samples (n=14,404) on FTA cards collected from malaria suspected patient in the five southern provinces on May or June 2017 to NCGM, Japan by a shipping company (EMS) with appropriate packing on 13th July 2018. An authorization for sending blood samples from the Lao PDR to Japan was obtained by Dr. Sengchanh Kounnavong, Director of Lao TPHI, the Ministry of Health before sending. A Memorandum of Understanding (MOU) for collaborative research was signed between NCGM and IPL before starting the SATREPS project. A Material Transfer Agreement (MTA) was included in the MOU. We conducted a training course on malaria for medical lab technicians in public healthcare facilities in Phongsaly province. The trainees (n=8) were from Phongsaly Provincial Hospital, Phongsaly Malaria Station, Gnot Ou District Health Department, Gnot Ou District Hospital, and four Health Centers in Gnot Ou district. Phongsaly province is the northern-most province in Lao PDR. Gnot Ou district is endemic area of P. falciparum and is adjacent to Yunnan province, China. Contents of the training were malaria diagnosis, treatment, prevention and situation of drug resistant malaria in the Greater Mekong Subregion including Lao PDR. In addition, we provided filter papers and informed consent forms to the medical lab technicians for collecting malaria patient blood samples. Then, we trained them how to collect the blood samples from malaria patients who visit their healthcare facilities. This training is for drug resistant malaria monitoring in the northern-most province in Lao PDR. In 2018, one Medical Lab Technician and one Junior Scientist in our lab attended training course on basic and molecular parasitology at NCGM, Tokyo, Japan on 4th February to 3rd March, and 25th July to 31st August, respectively. Refresher training course for Lab technicians at public healthcare facilities in Salavan and Sekong provinces. 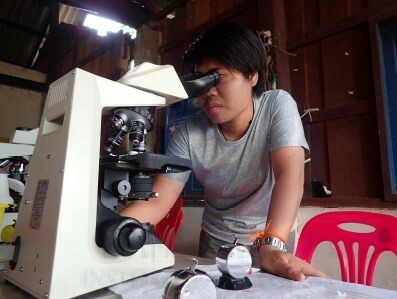 Dr. Phonepadith KATTIGNAVING, junior scientist of IPL conducted a short course of refresher training for lab technicians at public healthcare facilities in Salavan and Sekong provinces during the malaria patient blood sample collection in August 2018. Malaria outbreak occurred in Nong district, Savannakhet province during rainy season (June to September) in 2017. In the province, number of confirmed malaria cases gradually increased: 214 cases in June to 341 cases in September, which was two times higher than the cases in the same period of the previous year. In September, 66.9% of confirmed malaria cases (228/341) in the province were from Nong district. Then, a meeting for the outbreak investigation and response was organized by CMPE and WHO in October 2017. IPL was invited to the meeting and provided filter papers for collecting blood samples in the field investigation, but was not able to join the field investigation due to another activities. The malaria outbreak investigation was conducted in Nong district in November by CMPE, Savannakhet Provincial Health Department, Nong District Health Department, WHO and Population Education and Development Association (PEDA). The investigation team found that Coartem (artemether-lumefantrine) was stock-out in Nong District Hospital and all health centers in the district from the end of June to the beginning of August 2017. Therefore, no antimalarial drug was prescribed to malaria patients, but only paracetamol. The investigation team conducted mass blood survey in the district and collected dried blood samples (n=873) from villagers on filter papers (FTATM Classic Card, GE Healthcare Life Sciences, WhatmanTM, UK). We analyzed the blood samples by real-time nested PCR. The PCR detected Plasmodium infections in 12.6% of the samples (110/873). The species distribution was P. falciparum mono-infections at 88.2% (97/110), P. vivax mono-infections at 9.1% (10/110), and mixed infections with P. falciparum and P. vivax at 2.7% (3/110). We also analyzed mutation(s) in K13 gene of P. falciparum by PCR and DNA sequencing. Sixty-nine isolates were successfully sequenced and they had no mutation. The result was reported to CMPE and WHO. Team of the Lao-Japan Parasitology Lab, IPL conducted Malaria study and Schistosomiasis study under the scheme of JICA/AMED SATREPS project supported by Japanese government. The project also supported basic and molecular parasitology trainings for a junior scientist and a lab technician of our team in Japan in 2018. This activity report summarizes our activities and the results of the SATREPS project in the Parasitology Lab from November 2017 to October 2018. IPL has participated in the Lao National Schistosomiasis surveys conducted by the Lao Ministry of Health with support from WHO since 2016. Prevalence of Schistosomiasis mekongi was evaluated by a stool examination (Kato-Katz method) in seven sentinel site villages every year, and five–ten spot-check site villages, which were randomly selected every year, Khong and Mounlapamok districts, Champasak province before mass drug administration (MDA) by praziquantel at the end of year in the endemic areas (202 villages). In addition to the stool examination, IPL performed serological examination (ELISA) by using dried blood samples on filter papers since 2016, based on an advise of WHO technical advisors for Schistosomiasis elimination in Asia. In average, during 2016 and 2017, the prevalence of Schistosomiasis was 3.3% (0.0%–10.3%: n=1,966) by the Kato-Katz method, and 31.0% by the ELISA method (2.0%–53.5%: n=2,600) using S. japonicum egg antigen, respectively. Prevalence of S. mekongi in the intermediate freshwater snail (Neotricula aperta) was also evaluated by DNA diagnostic method (LAMP) developed by the SATREPS project. More than 3,000 snails were collected in Khon Island, which is one of the highest endemic villages of Schistosomiasis in Khong district, once a year from 2016 to 2018. The prevalence of S. mekongi in the snail was decreasing 0.26% in 2016, 0.08% in 2017, and less than 0.03% in 2018 by the LAMP method. By combining the satellite data with the LAMP data, we found that the positivity rate of Schistosoma infection was correlated with rainy precipitation of the previous year. Animal Schistosomiasis study was conducted in the seven sentinel site villages in Khong and Mounlapamok districts, Champasak province in 2018, by collaboration with the Lao TPHI, National Animal Health Laboratory, Provincial and District Health Departments and Provincial and District Agriculture Departments. Five domesticated animal species (dog, cattle, water buffalo, pig, and goat) were included for this study. Stool samples were collected from the animals and examined by microscopic examination (FECT method) at the Lao TPHI and by DNA diagnostic method (LAMP method) at IPL. From the stool samples. no S. mekongi egg was detected by the FECT method, whereas S. mekongi DNA was detected by the LAMP method from one dog (1/144) and one pig (1/153). We discovered the first human infection case with monkey malaria parasite (P. knowlesi) in Attapeu province in 2016. It should be noted that human P. knowlesi infection has the potential to follow a severe (even fatal) course and that the malaria RDT (Malaria Ag P.f/P.v, Standard Diagnostics, the Republic of Korea) used in Lao PDR cannot differentiate between P. knowlesi infection and P. vivax infection. We have been monitoring the frequency and distribution of artemisinin resistant P. falciparum malaria in the five southern provinces and the northern-most province (Pongsaly), Lao PDR, by using molecular markers “mutation (s) of K13 gene” and DNA polymorphisms on the upstream region of the K13 gene. Our DNA analysis demonstrated that an artemisinin resistant lineage of P. falciparum originated from western Cambodia has spread into Lao PDR and has been progressing toward the north in the country. Moreover, The resistant parasite has already reached Pongsaly province, which is adjacent to Yunnan province, China. We conducted an interview survey on malaria patients’ adherence to ACTs in Savannakhet province. The adherence to ACTs seemed well (94.4%: 51/54). Only three patients stopped medication because they felt better, even though the importance of completing the regimen was explained when prescribed. DNA analysis of G6PD gene among G6PD deficient population (n=136) showed that 90 had the G6PD Viangchan variant (871G>A), which is common variant in Lao PDR. Three had the Canton variant (1376G>T), and two had the Mahidol variant (487G>A). The percentages of G6PD deficient villagers confirmed by the genetic analysis were as follows: 6.1% in Champasak, 5.5% in Savannakhet, and 0.5% in Phongsaly. To avoid complications such as acute hemolytic anemia, the G6PD status of P. vivax malaria patients must be known prior to prescribing primaquine to them. Malaria perception among military personnel in Champasak and Attapeu provinces, and villagers in Savannakhet province was evaluated by mixed methods study. Both quantitative and qualitative data were collected. The qualitative data was collected through focus group discussions and in-depth interviews. Surprisingly, many participants did not know that malaria is transmitted by Anopheles mosquito bites, but believed that it was transmitted by through drinking “stream water”, “contaminated water”, or “water with mosquito eggs or larvae”. Providing adequate and appropriate health education should be established among them. Ms. Pheovaly SOUNDALA, lab technician and Dr. Sengdeuane KEOMALAPHET, junior scientist of IPL, attended training courses on basic and molecular parasitology on February to March, and July to August, respectively at Department of Tropical Medicine and Malaria, Research Institute, National Center for Global Health and Medicine, Tokyo, Japan. Dr. Phonepadith KATTIGNAVING, junior scientist of IPL conducted a short course of refresher training for lab technicians in public healthcare facilities in Salavan and Sekong provinces during malaria patient blood collection in August 2018. +Section of Environmental Parasitology, Department of International Health Development, Division of Public Health, Graduate School, Tokyo Medical and Dental University, Tokyo, Japan. Iwagami M, Tangpukdee N, Wilairatana P, Krudsood S, Dao LD, Nakazawa S, Sinuon M, Socheat D, Yasuoka J, Jimba M, Watanabe H, Kobayashi J, Toma H, Vanisaveth V, Hongvanthong V, Brey PT, Kano S. Pfcrt genotypes and microsatellite DNA polymorphisms flanking the gene on Plasmodium falciparum suggest different chloroquine selective pressure among populations in the Greater Mekong Subregion, Parasitology International, 67: 816-823, 2018. Iwagami M, Nakatsu M, Khattignavong P, Soundala P, Lorphachan L, Keomalaphet S, Xangsayalath P, Kawai S, Hongvanthong B, Brey PT, Kano S. First confirmed case of human infection with Plasmodium knowlesi in Lao PDR, PLOS Neglected Tropical Diseases, 12(3): e0006244, 2018. Iwagami M, Keomalaphet S, Khattignavong P, Soundala P, Lorphachan L, Matsumoto-Takahashi E, Strobel M, Reinharz D, Phommasansack M, Hongvanthong B, Brey PT, Kano S. The detection of cryptic Plasmodium infection among villagers in Attapeu province, Lao PDR. PLOS Neglected Tropical Diseases, 11(12): e0006148, 2017. Inthavong N, Nonaka D, Kounnavong S, Iwagami M, Phommala S, Kobayashi J, Hongvanthong B, Pongvongsa T, Brey PT, Kano S. Individual and household factors associated with incidences of village malaria in Xepon district, Savannakhet province, Lao PDR. Tropical Medicine and Health, 45: 36, 2017. Ong KIC, Kosugi H, Thoeun S, Araki H, Thandar MM, Iwagami M, Hongvanthong B, Brey PT, Kano S, Jimba M. Systematic review of the clinical manifestations of glucose-6-phosphate dehydrogenase deficiency in the Greater Mekong Subregion: implications for malaria elimination and beyond. BMJ Global Health, 2: e000415, 2017. Ménard D, Khim N, Beghain J, Adegnika AA, Shafiul-Alam M, Amodu O, Rahim-Awab G, Barnadas C, Berry A, Boum Y, Bustos MD, Cao J, Chen JH, Collet L, Cui L, Thakur GD, Dieye A, Djallé D, Dorkenoo MA, Eboumbou-Moukoko CE, Espino FE, Fandeur T, Ferreira-da-Cruz MF, Fola AA, Fuehrer HP, Hassan AM, Herrera S, Hongvanthong B, Fouzé S, Ibrahim ML, Jahirul-Karim M, Jiang L, Kano S, Ali-Khan W, Khanthavong M, Kremsner PG, Lacerda M, Leang R, Leelawong M, Li M, Lin K, Mazarati JB, Ménard S, Morlais I, Muhindo-Mavoko H, Musset L, Na-Bangchang K, Nambozi M, Niaré K, Noedl H, Ouédraogo JB, Pillai DR, Pradines B, Quang-Phuc B, Ramharter M, Randrianarivelojosia M, Sattabongkot J, Sheikh-Omar A, Silué KD, Sirima SB, Sutherland C, Syafruddin D, Tahar R, Tang LH, Touré OA, Tshibangu-wa-Tshibangu P, Vigan-Womas I, Warsame M, Wini L, Zakeri S, Kim S, Eam R, Berne L, Khean C, Chy S, Ken M, Loch K, Canier L, Duru V, Legrand E, Barale JC, Stokes B, Straimer J, Witkowski B, Fidock DA, Rogier C, Ringwald P, Ariey F, Mercereau-Puijalon O; KARMA Consortium. A Worldwide Map of Plasmodium falciparum Artemisinin Resistance. New England Journal of Medicine, 374: 2453–2464, 2016. 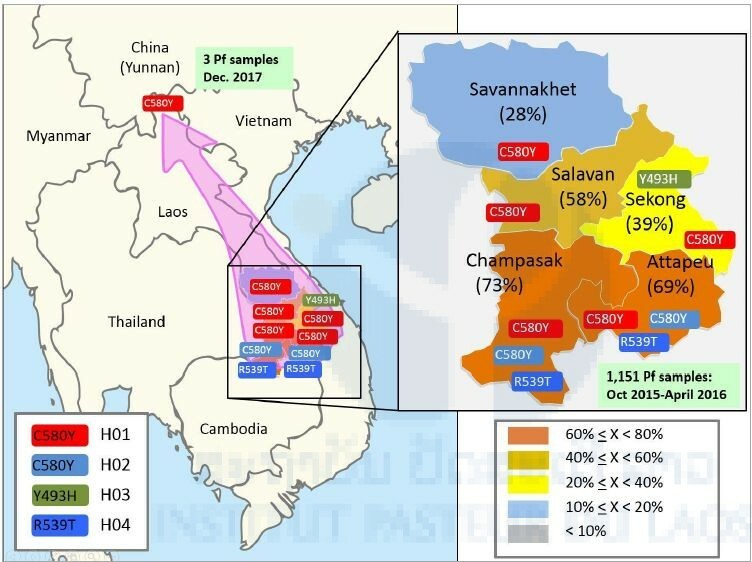 Pongvongsa T, Nonaka D, Iwagami M, Nakatsu M, Phongmany P, Nishimoto F, Kobayashi J, Hongvanthon B, Brey PT, Moji K, Mita T, Kano S. Household clustering of asymptomatic malaria infections in Xepon district, Savannakhet province, Lao PDR. Malaria Journal, 15: 508, 2016. Keomalaphet S, Khattignavong P, Soundala P, Lorphachan L, Nakatsu M, Iwagami M, Hongvanthong B, Brey BT, Kano S. Artemisinin resistance in Plasmodium falciparum in malaria endemic areas, Laos, Amari Watergate Bangkok, Bangkok, Thailand, December 12th–14th, 2018. Iwagami M, Nakatsu M, Khattignavong P, Soundala P, Keomalaphet S, Matsumoto-Takahashi E, Pommelet V, Hongvanthong B, Brey PT, Kano S. Rapid increase and northward spread of artemisinin-resistant Plasmodium falciparum in Laos, Institut Pasteur International Network Symposium 2018, Institut Pasteur Paris, Paris, France, November 15th–16th, 2018. Sasaki Y, Oyoshi K, Mizukami Y, Tden T, Matsumoto-Takahashi E, Iwagami M, Kano S, Mosquito’s habitat suitable index map using earth observation satellite data in Lao PDR, The 59th Annual Meeting of Japanese Society of Tropical Medicine, Nagasaki University, Nagasaki, Japan, November 9th–11th, 2018. Nakatsu M, Iwagami M, Keomalaphet K, Khattignavong P, Soundala P, Lorphachan L, Hongvanthong B, Brey P, Kano S. Artemisinin resistant Plasmodium falciparum spreading northward from south part of Lao, The 59th Annual Meeting of Japanese Society of Tropical Medicine, Nagasaki University, Nagasaki, Japan, November 9th–11th, 2018. Matsumoto-Takahashi E, Kumagai T, Sasaki Y, Mizukami Y, Oyoshi K, Iwagami M, Kano S. Climate change and Schistosomiasis mekongi in Lao PDR: Spatial epidemiology using earth observation satellite data, The 78th Annual Meeting of Eastern Branch of Japanese Society of Parasitology, Jichi Medical University, Tochigi Shimotsuke, Japan, October 20th, 2018. Vilay P, Nonaka D, Senamonty P, Lao M, Iwagami M, Kobayashi J, Hernandez PM, Phrasisombath K, Kounnavong S, Hongvanthong B, Brey PT, Kano S. Malaria prevalence, perception, preventive and treatment behaviours among military personnel in Champasak and Attapeu provinces, Lao PDR: a mixed methods study, The 12th National Health Research Forum, Crowne Plaza Hotel, Vientiane Capital, Lao PDR, October 16th–17th, 2018. Keomalaphet S, Khattignavong P, Soundala P, Lorphachan L, Nakatu M, Iwagami M, Hongvanthong B, Brey PT, Kano S. Detection of cryptic Plasmodium infections among villagers in malaria endemic areas in Lao PDR, The 12th National Health Research Forum, Crowne Plaza Hotel, Vientiane Capital, Lao PDR, October 16th–17th, 2018. Iwagami M, Nakatsu M, Keomalaphet S, Khattignavong P, Soundala P, Lorphachan L, Hongvanthong B, Brey PT, Kano S. Artemisinin resistant Plasmodium falciparum in Lao PDR, The 12th National Health Research Forum, Crowne Plaza Hotel, Vientiane Capital, Lao PDR, October 16th–17th, 2018. Ong KIC, Iwagami M, Khattignavong P, Keomalaphet S, Lorphachan L, Soundala P, Prasayasith P, Xangsayarath P, Hongvanthong B, Brey PT, Kano S, Jimba M. Glucose-6-phosphate dehydrogenase (G6PD) deficiency among people in malaria endemicc areas in Lao People’s Democratic Republic, The 12th National Health Research Forum, Crowne Plaza Hotel, Vientiane Capital, Lao PDR, October 16th–17th, 2018. Kumagai T, Iwagami M, Takahashi-Matsumoto E, Yamabe M, Keomalaphet S, Khattignavong P, Lorphacan L, Soundala P, Hongvanthong B, Oyoshi K, Mizukami Y, Sasaki Y, Ohta N, Brey PT, Kano S. The development of a risk map for schistosemiasis mekongi by combining LAMP diagnosis with the satellite data in Champasak province, Laos, The 12th National Health Research Forum, Crowne Plaza Hotel, Vientiane Capital, Lao PDR, October 16th–17th, 2018. Khattignavong P, Keomalaphet S, Lorphacan L, Soundala P, Prasayasith P, Sayasone S, Kumagai T, Iwagami M, Kounnavong S, Hongvanthong B, Brey PT, Kano S. Prevalence of schistosemiasis mekongi in Champasak province, Lao PDR: Comparison between microscopy by Kato-Katz method and serological testing by ELISA, The 12th National Health Research Forum, Crowne Plaza Hotel, Vientiane Capital, Lao PDR, October 16th–17th, 2018. Prasayasith P, Khattignavong P, Keomalaphet S, Lorphacan L, Soundala P, Araki H, Ong KIC, Kumagai T, Iwagami M, Hongvanthong B, Jimba M, Brey PT, Kano S. Prevalence of opisthorchiasis viverrini and a possibility of using “Positive Deviance Approach” for the control in Lao PDR, The 12th National Health Research Forum, Crowne Plaza Hotel, Vientiane Capital, Lao PDR, October 16th–17th, 2018. Iwagami M, Nakatsu M, Khattignavong P, Soundala P, Lorphachan L, Keomalaphet S, Xangsayalath P, Matsumoto-Takahashi E, Pommelet V, Hongvanthong B, Brey PT, Kano S. DNA analysis revealed rapid increase and northward spread of artemisinin-resistant Plasmodium falciparum in Laos, The 14th International Congress of Parasitology, EXCO Convention Center, Taegu, the Republic of Korea, August 19th–24th, 2018. Kano S, Iwagami M, Hongvanthong B, Brey PT. The “Super Malaria” overrunning northward in Laos! The 1st Malaria World Congress 2018, Melbourne, Australia, July 1st–5th, 2018. 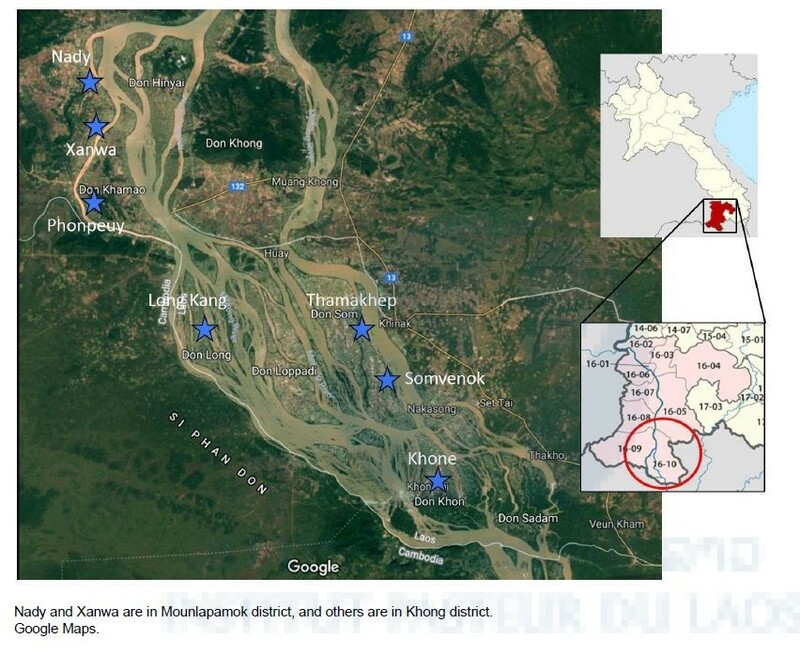 Iwagami M, Nakatsu M, Khattignavong P, Soundala P, Lorphachan L, Keomalaphet S, Xangsayalath P, Kawai S, Hongvanthong B, Brey PT, Kano S. First reported case of human infection with Plasmodium knowlesi in Laos, The 87th Annual Meeting of Japanese Society of Parasitology, National Center for Global Health and Medicine, Tokyo, Japan, March 17th–18th, 2018. Nakatsu M, Iwagami M, Keomalaphet S, Khattignavong P, Soundala P, Lorphachan L, Hongvanthong B, Brey P, Kano S. Artemisinin resistant Plasmodium falciparum is spreading northward in southern part of Laos, The 87th Annual Meeting of Japanese Society of Parasitology, National Center for Global Health and Medicine, Tokyo, Japan, March 17th–18th, 2018. Kumagai T, Iwagami M, Yamabe M, Matsumoto-Takahashi E, Keomalaphet S, Khattignavong P, Lorphachan L, Soundala P, Hongvanthong B, Ohta N, Brey PT, Kano S. The evaluations of risk-map using the infected snail with Schistosoma mekongi by LAMP assay, The 87th Annual Meeting of Japanese Society of Parasitology, National Center for Global Health and Medicine, Tokyo, Japan, March 17th–18th, 2018. Keomalaphet S, Iwagami M. SATREPS Project in Laos, Japan’s experiences in EID control through international scientific joint research activities, Side meeting, Prince Mahidol Award Conference, The Centara Grand & Bangkok Convention Centre at Central World, Bangkok, Thailand, January 29th–February 3rd, 2018. Khattignavong P, Keomalaphet S, Lorphacan L, Soundala P, Sayasone S, Kumagai T, Iwagami M, Kounnavong S, Hongvanthong B, Brey PT, Kano S. Prevalence of Schistosomiasis mekongi based on stool examination and ELISA technique in Lao PDR, Joint International Tropical Medicine Meeting 2012, Amari Watergate Bangkok, Bangkok, Thailand, December 12th–14th, 2018. Iwagami M, Nakatsu M, Khattignavong P, Soundala P, Lorphachan L, Keomalaphet S, Xangsayalath P, Matsumoto-Takahashi E, Pommelet V, Hongvanthong B, Brey PT, Kano S. Rapid increase and northward spread of artemisinin resistant Plasmodium falciparum in Laos, The 67th Annual Meeting of American Society of Tropical Medicine and Hygiene, Sheraton New Orleans and New Orleans Marriott, New Orleans, Louisiana, USA, October 28th–November 2nd, 2018. Takahashi E, Nonaka D, Iwagami M, Kobayashi J, Kounnavong S, Hongvanthong B, Pongvongsa T, Brey PT, Kano S. Adherence to the artemisinin-based combination therapy in a rural area of Savannakhet province in Laos, The 50th Asia-Pacific Academic Consortium for Public Health Conference, The MAGELLAN SUTERA hotel, Kota Kinabalu, Sabah, Malaysia, September 12th–14th, 2018. Inthavong N, Nonaka D, Kounnavong S, Iwagami M, Phommala S, Kobayashi J, Hongvanthong B, Pongvongsa T, Brey PT, Kano S. Individual and household factors associated with village malaria incidences in Xepon district, Savannakhet province, Lao PDR, Joint International Tropical Medicine Meeting 2017, Amari Watergate Bangkok, Bangkok, Thailand, December 6th–8th, 2017. Iwagami M, Nakatsu M, Keomalaphet S, Khattignavong P, Soundala P, Lorphachan L, Xangsayalath P, Pommelet V, Hongvanthong B, Brey PT, Kano S. Spread of artemisinin resistant Plasmodium falciparum in five Southern provinces of Lao PDR in 2015-2016, The 66th Annual Meeting of American Society of Tropical Medicine and Hygiene, Baltimore Convention Center, Baltimore, Maryland, USA, November 5th–9th, 2017. Ong KIC, Iwagami M, Hongvanthong B, Brey PT, Kano S, Jimba M. Towards malaria elimination in Lao PDR: a mixed methods study on health-seeking behaviors among different ethnic groups living in malaria endemic areas, The 3rd Annual the Future of Malaria Research Symposium, The Johns Hopkins Bloomberg School of Public Health, Baltimore, Maryland, USA, November 3rd, 2017. We wish to thank Dr. Bouasy HONGVANTHONG, Director of the Center of Malariology, Parasitology and Entomology (CMPE), the Ministry of Health, Lao PDR, and Project Director of the SATREPS Project for his kind support to this project. We thank Dr. Tiengkham PONGVONGSA, Deputy Director, Savannakhet Provincial Health Department, Lao PDR. We also thank the staff of the CMPE, the Lao TPHI, Provincial Health Departments, Provincial Hospitals, District Hospitals, and Health Centers, The Ministry of Health, for supporting our field surveys and training courses. This work is supported by the SATREPS (Science and Technology Research Partnership for Sustainable Development) project from the Japan International Cooperation Agency (JICA) and the Japan Agency for Medical Research and Development (AMED). 1. Ashley EA, Dhorda M, Fairhurst RM, Amaratunga C, Lim P, Suon S, et al. Spread of artemisinin resistance in Plasmodium falciparum malaria. New England Journal of Medicine, 371: 411–423, 2014. 2. Ménard D, Khim N, Beghain J, Adegnika A, Alam M, Amodu O, et al. A Worldwide Map of Plasmodium falciparum Arteminisin Resistance. New England Journal of Medicine, 374:2453–2464, 2016. 3. Howes RE, Dewi M, Piel FB, Monteiro WM, Battle KE, Messina JP, et al. Spatial distribution of G6PD deficiency variants across malaria-endemic regions, Malaria Journal, 12: 418, 2013. 4. Ong KIC, Kosugi H, Thoeun S, Araki H, Thandar MM, Iwagami M, et al. Systematic review of the clinical manifestations of glucose-6-phosphate dehydrogenase deficiency in the Greater Mekong Subregion: implications for malaria elimination and beyond. BMJ Global Health, 2: e000415, 2017. 5. 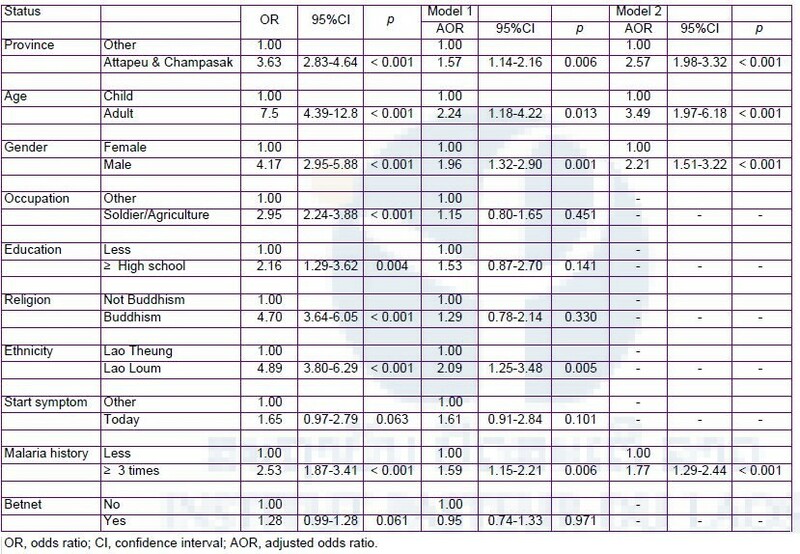 Sayasone S, Utzinger J, Akkhavong K, Odermatt P. Repeated stool sampling and use of multiple techniques enhance the sensitivity of helminth diagnosis: a cross-sectional survey in southern Lao People’s Democratic Republic. Acta Tropica, 141(Pt B): 315–321, 2015. 6. Vonghachack Y, Odermatt P, Taisayyavong K, Phounsavath S, Akkhavong K, Sayasone S. Transmission of Opisthorchis viverrini, Schistosoma mekongi and soil-transmitted helminthes on the Mekong Islands, Southern Lao PDR. Infectious Diseases of Poverty, 6: 131, 2017. 7. Sayasone S, Vonghajack Y, Vanmany M, Rasphone O, Tesana S, Utzinger J, et al. Diversity of human intestinal helminthiasis in Lao PDR. Transactions of the Royal Society of Tropical Medicine and Hygiene, 103: 247–254, 2009. 8. Singh B, Daneshvar C. Human Infections and Detection of Plasmodium knowlesi. clinical microbiology reviews, 26: 165–184, 2013. 9. Marchand RP, Culleton R, Maeno Y, Quang NT, Nakazawa S. Co-infections of Plasmodium knowlesi, P. falciparum, and P. vivax among Humans and Anopheles dirus Mosquitoes, Southern Vietnam. Emerging Infectious Diseases, 17: 1232–1239, 2011. 10. Jongwutiwes S, Buppan P, Kosuvin R, Seethamchai S, Pattanawong U, Sirichaisinthop J, et al. Plasmodium knowlesi Malaria in humans and macaques, Thailand. Emerging Infectious Diseases, 17: 1799–1806, 2011. 11. Jiang N, Chang Q, Sun X, Lu H, Yin J, Zhang Z, et al. Co-infections with Plasmodium knowlesi and other malaria parasites, Myanmar. Emerging Infectious Diseases, 16:1476–1478, 2010. 12. Tanizaki R, Ujiie M, Kato Y, Iwagami M, Hashimoto A, Kutsuna S, et al. First case of Plasmodium knowlesi infection in a Japanese traveler returning from Malaysia. Malaria Journal, 12: 128, 2013. 13. Zhang X, Kadir KA, Quintanilla-Zariñan LF, Villano J, Houghton P, et al. Distribution and prevalence of malaria parasites among long-tailed macaques (Macaca fascicularis) in regional populations across Southeast Asia. Malaria Journal, 15: 450, 2016. 14. Kumar S, Stecher G, Tamura K. MEGA7: Molecular Evolutionary Genetics Analysis Version 7.0 for Bigger Datasets. Molecular Biology and Evolution, 33: 1870–1874, 2016. 15. Iwagami M, Nakatsu M, Khattignavong P, Soundala P, Lorphachan L, Keomalaphet S, et al. First confirmed case of human infection with Plasmodium knowlesi in Lao PDR. PLOS Neglected Tropical Diseases, 12: e0006244, 2018. Table 1. Results of the Kato-Katz stool examination in the Schistosomiasis spot-check survey, Khong district, Champasak province in 2017. Table 2. Summary of samples in the Schistosomiasis spot-check survey, Khong district, Champasak province in August – September 2018. Table 3. 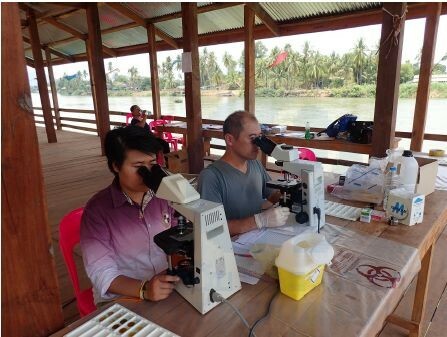 Results of the Kato-Katz stool examination in the Schistosomiasis spot-check survey, Khong district, Champasak province in August – September 2018. Table 4. Prevalence of Schistosoma mekongi by Kato-Katz stool examination and ELISA among villagers in Khong and Mounlapamok districts, Champasak province from 2016-2017. Table 5. Numbers of stool and blood samples collected from domestic animals in the seven sentinel site villages in Khong and Mounlapamok districts, Champasak province in 2018. Table 6. Result of stool examination by FECT among domestic animals in the seven sentinel site villages in Khong and Mounlapamok districts, Champasak province in 2018. Table 7. Frequencies of artemisinin resistant mutations in K13 gene of P. falciparum in the five southern provinces. Table 8. Multivariate logistic regression analyses to identify risk factors for contracting the K13 mutated P. falciparum. Table 9. Distribution of malaria infection according to species among those who tested positive by PCR (n = 35) and RDT (n = 10). Table 10. Knowledge on transmission routes and symptoms of malaria among study participants of Lao military (n = 274). Table 11. Summary of blood samples collected from malaria patients in the five southern provinces in 2018 and malaria suspected patients in the northern-most province (Phongsaly) in 2017. Figure 1. Seven sentinel site villages for monitoring Schistosomiasis in Khong and Mounlapamok districts, Champasak province. Figure 2. Phylogenetic analyses of a Plasmodium knowlesi isolate collected from a malaria patient in Southern part of Lao PDR. A) The phylogenetic tree of P. knowlesi and other malaria parasites inferred using partial msp1 DNA sequences. B) The phylogenetic tree of P. knowlesi and other malaria parasites inferred using partial cytb DNA sequences. The analysis was conducted using MEGA software version 7.0.21 (14) by the neighbor-joining algorithm with Kimura’s 2-parameter model. The bootstrap values from 1,000 replicates are shown at node. Scale bars represent number of nucleotide substitutions per site. GenBank accession numbers and country of origin are shown in related sequences. “No. 947 Lao PDR” indicates the sample sequenced in this study. Figure 3. Percentages and types of resistant mutations in the K13 gene in P. falciparum isolates in the five southern provinces. Red with C580Y represents haplotype 1 (H01), light blue with C580Y represents haplotype 2 (H02), light green with Y493H represents haplotype 3 (H03), and blue with R539T represents haplotype 4 (H04). We found three resistant isolates of P. falciparum from the Lao-Chinese border.